Tassel Twirl Magazine just launched a sister publication called Calendar Girls. Dedicated to seasonal pinup imagery, the magazine’s first issue focuses on autumn and Halloween. There are two great covers to choose from, and two photos of me inside by Miss Missy! I’m a Halloween cat, wearing Deadly Dames capris, Laura Byrnes lace bolero, Chelsea Crew shoes, and a Goddess vintage style longline bra. For 15% off any Tassel Twirl or Calendar Girls issues through December 1, 2014, use code MAGCLOUDXMAS. Happy Halloween, pin up kitty style! Pin up style black cat – good grooming is important! Now that Thanksgiving is over and nighttime temperatures drops below 40 degrees Farenheit, it might as well be winter. That means it’s time for warm, vintage-style daywear and festive holiday frocks! This post is about the daytime stuff! Known primarily for their sunny cotton dresses, Heartbreaker Fashion (soon to be “Heart of Haute”) brings you something entirely new this season: cozy flannel dresses and separates in great mix ‘n’ match color schemes. 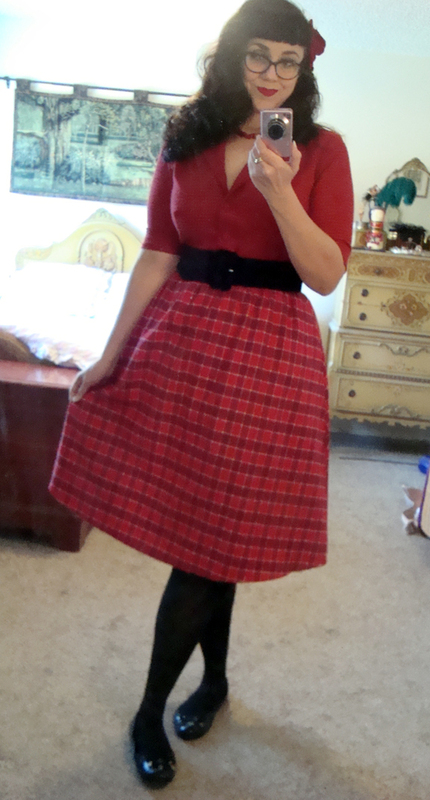 I picked up the Margie skirt in red and the Gretta top in coordinating red check, which you can see at left. I got my regular Heartbreaker size, XL (42-32/33-48″). 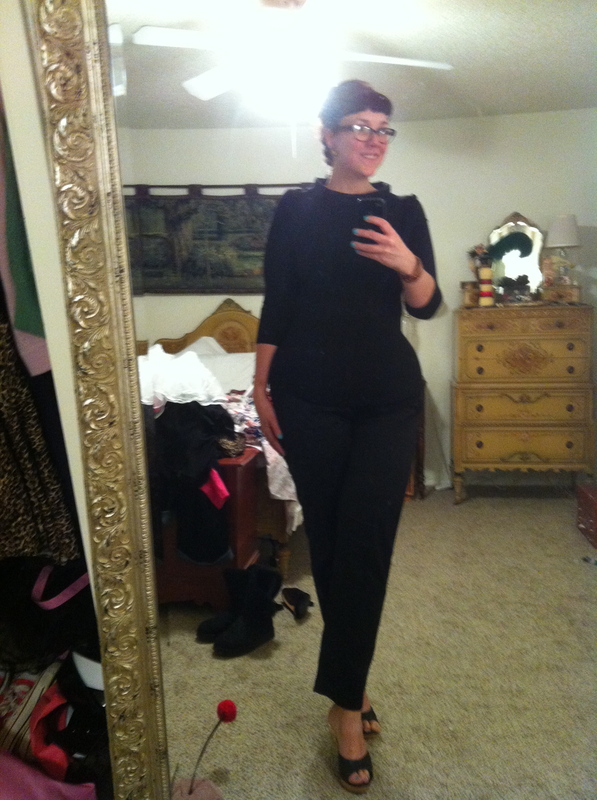 As usual with Heartbreaker, the Gretta top arms run on the lean side and the waist is roomy. The Margie skirt waist is true to the stated size chart measurements. I wear mine with tights and a Deadly Dames velvet belt. Warm, comfortable, and festive! Thanksgiving is one of my favorite holidays. There’s the food, the family, the official start of the Christmas season…and Black Friday sales. I celebrated with some fun vintage-inspired items from Pinup Girl Clothing and Kate Spade, several of which I was able to share on my brand new Instagram account. Black Friday Haul: Odds ‘n’ ends. Yes, I caved, and you can follow me as Instagram user “magicskyway.” Among the odds and ends I’ve deposited there are some collages of my Black Friday haul, which included 1940s-style Rita pumps by Remix, Kate Spade bow flats, a Pinup Couture Jenny skirt featuring a vintage Venetian scene, the Laura Byrnes Madeline dress in green plaid with matching bolero (finally! ), and more. 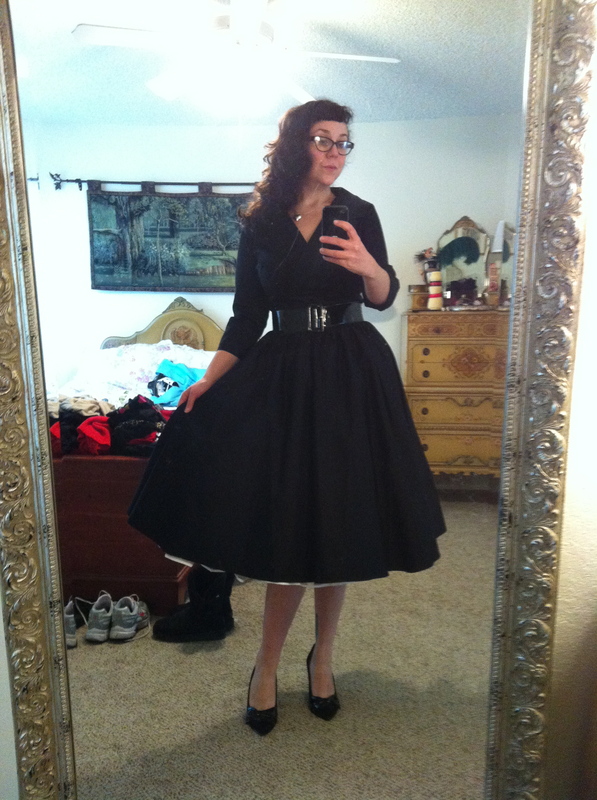 Black Friday Haul: Madeline dress and matching bolero. That’s my Black Friday story for this year. What’s yours? A vintage and repro autumn! Since the weather’s finally turned, it’s time to share some autumnable vintage and vintage-inspired dresses and separates! Collectif Simone Doll Dress in grey houndstooth. First up is Collectif’s Simone Doll dress in grey houndstooth, a late 1940s/early 1950s-style day dress with a princess-style skirt. First introduced last fall, it’s available in four fall-appropriate colors. 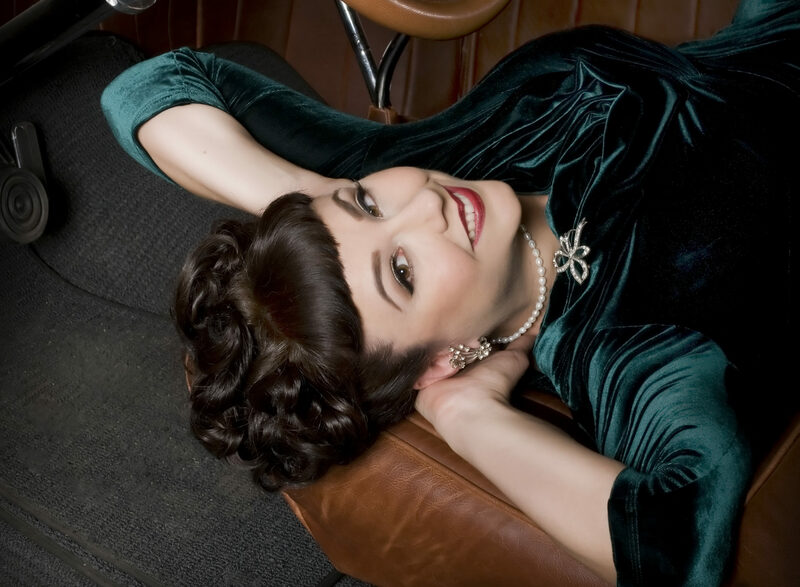 Since Collectif’s measurements are all over the map and their website provides virtually no guidance in this regard, it’s best to ask around to see how a particular style or fabricway fits! On the advice of friends, I chose the UK size 16 and wasn’t disappointed. At 42-32-48″, I had no major fit issues. There is a bit of extra room in the shoulders and the drape of the fabric makes it a good idea to wear Spanx underneath to avoid lines, but nothing to make me run screaming. Laura Byrnes High-Waisted Trousers and Joanie top. Back in November I posted about pants. I’m happy to report that the long Laura Byrnes High-Waisted Trousers in black fit as well as the cropped version I love! They hit just below the ankle, which is a good length for cigarette-style pants. The high front waistband totally controls my loose midriff skin and the stitched front leg creases keep the pants looking crisp and fresh. Here, I paired them with my Laura Byrnes Joanie top and ReMix slides. The result is very Kim Novak circa Bell, Book & Candle with a dash of cowl neckline from an original series Star Trek skant. Those who want in the high-waisted trousers in other colors (they come in red and a rich royal blue, too) should know that the blue version runs a bit leaner than the black. Size accordingly! For the record, I’m 5’8″ tall with about a 34″ inseam. 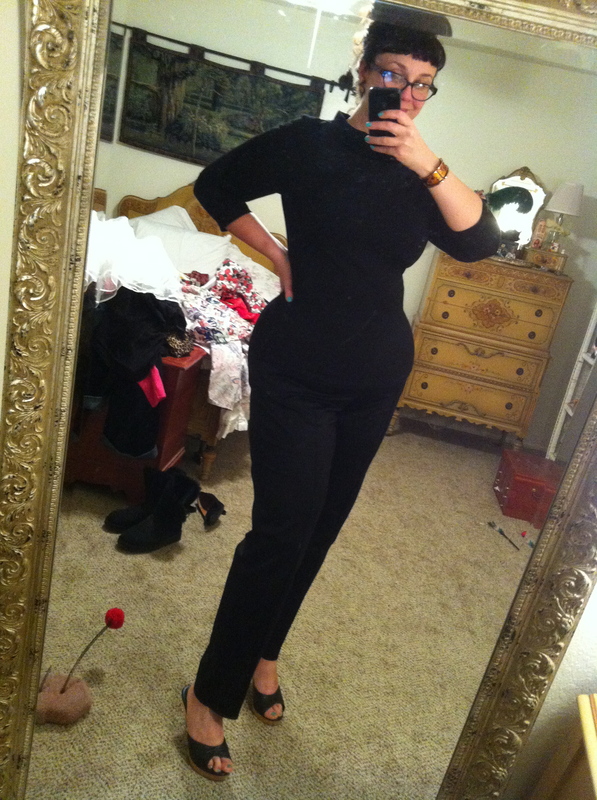 I purchased the 2x size for my 32/33″ waist and 48″ hips. The wide variety of vintage-inspired, retro, rockabilly, and pinup-style fashions available online is both a blessing and a curse, especially if you like to wear dresses. There are literally hundreds of options available at a variety of price points, from slinky and elegant pencil dresses in work-perfect, subdued colors to frothy tulle gowns in bright tones. It’s fun to check out all the pretty clothes, but it’s also really easy to get overwhelmed.